Towards the end of the SCPH-10x PSone production Sony revised the board slightly and released the PM-41 (2) board. This page covers the installation diagram for installing an MM3 chip into the PM-41 (2). 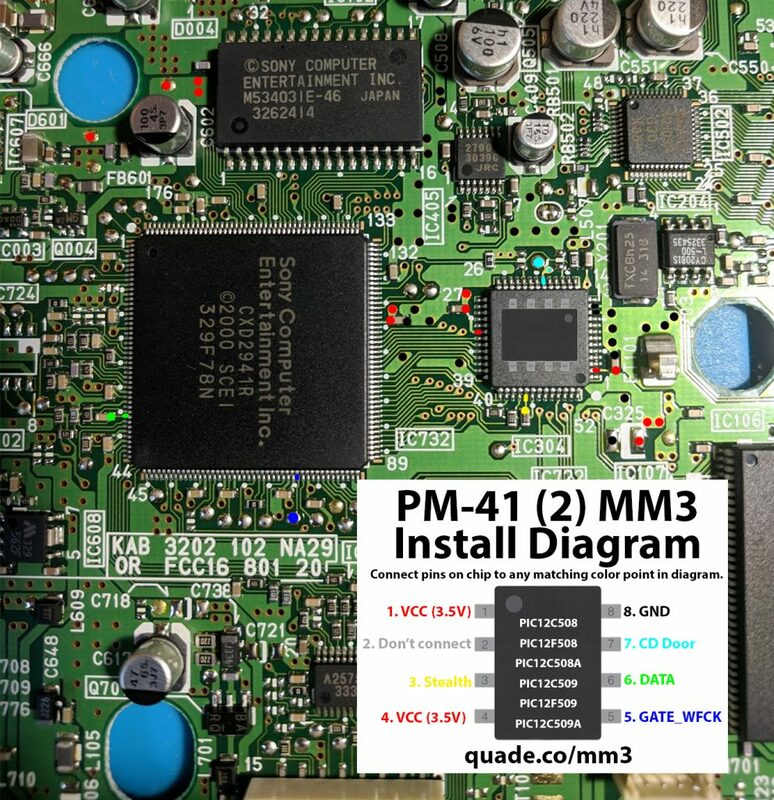 The first time I modded a PM-41 (2) I wasn’t able to find an installation diagram, but was able to figure out how everything should be wired through a combination of trial and error, and the diagram for the original PM-41 board. This first one has pin one and pin four on the chip connected together. Pin four normally connects to the reset button, but since the slim PS1 doesn’t have a reset button it doesn’t have anywhere to connect. It can either be left disconnected, or connected to pin one (tied to a high voltage signal). Yes it is. Pin 4 is used for the reset button on fat model PS1’s. So for the SCPH-101 that doesn’t have a reset button you can either leave pin 4 disconnected, or connect it to the positive voltage supply (which is pin 1 on the MM3 chip). The diagram looks good. Like Nathan said, I think the Pin 4 adjustment should be mentioned in the instructions. Also I’d like to know what the red dots are for. they were a bit confusing and I saw them on other diagrams. 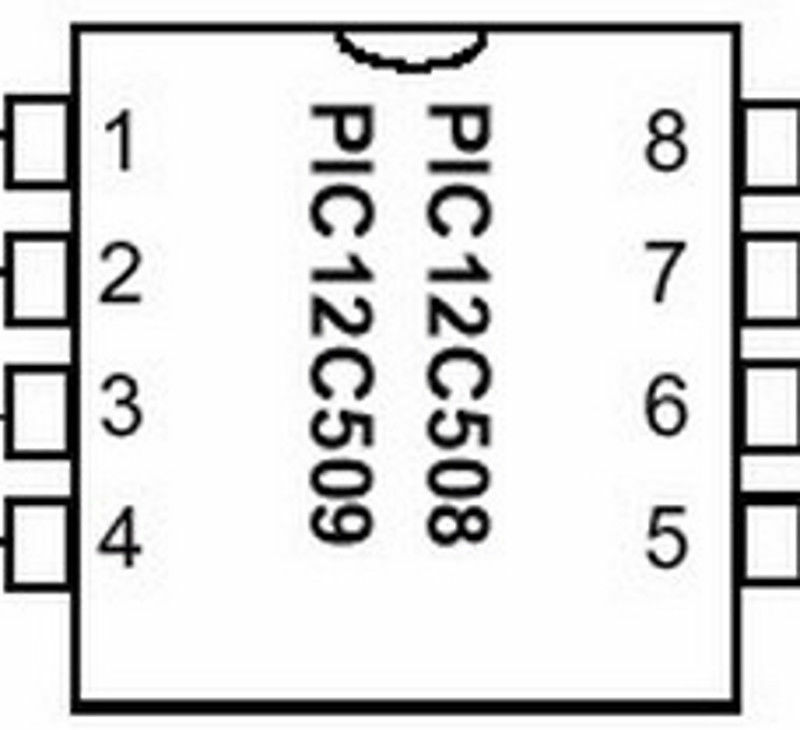 Speaking of other diagrams I’ve seen one where pin 3 is one resistor over incorrectly (?) It looks like you adjusted the diagram because of that, but I think that shoud also be mentioned in the instructions. Yeah, I went ahead and updated this page. I’m not sure where the red circles are from. The one at the very top could be an alternate positive voltage or ground connection for pin 1 or 8 on the chip (I’d have to measure it to know for sure). The other one doesn’t even have any arrow or anything. The incorrect pin 3 problem is in a ton of diagrams. I really try making a cleaner diagram from scratch the next time I have a PM-41 (2) board available. Attempted my first ever mod chip installation with this board today. I bought some of your pre-wired chips off of ebay. Man, some of those soldering spots are so tiny. But fortunately I got them all in place according to the diagram and it worked great! Tomorrow I’ll attempt console #2. Awesome. Good luck on your second system. I just installed the MM3 I bought from you on ebay on a PM-41 (2 ) board. It works great. Tiny amounts of solder and a gentle hand with the iron made for a successful first attempt. Thanks for hooking me up. i have got a problem: i soldered like the diagram shows but it doesnt work somehow…how do I have to solder pin 3 and 6? should i get them off at first? You can email me some pictures of your installation (liam@quade.co). Pins 1, 3, 5, 6, 7, and 8 are all required. Make sure your wires are as short as possible and that you didn’t switch around any of the pin numbers on accident. Hi guys I purchased one of the chips for my psone schp-101 and the number 3 resistor or whatever it is come off and I’m having a hard time getting it back on. Any suggestions? I have the chip still just can’t get t to stay in place. The same process works with smaller ones like with the one in the PS1. Before you start you’ll probably want to clean off the solder already on the pads with some wick, just be careful so you don’t rip off one of the pads. 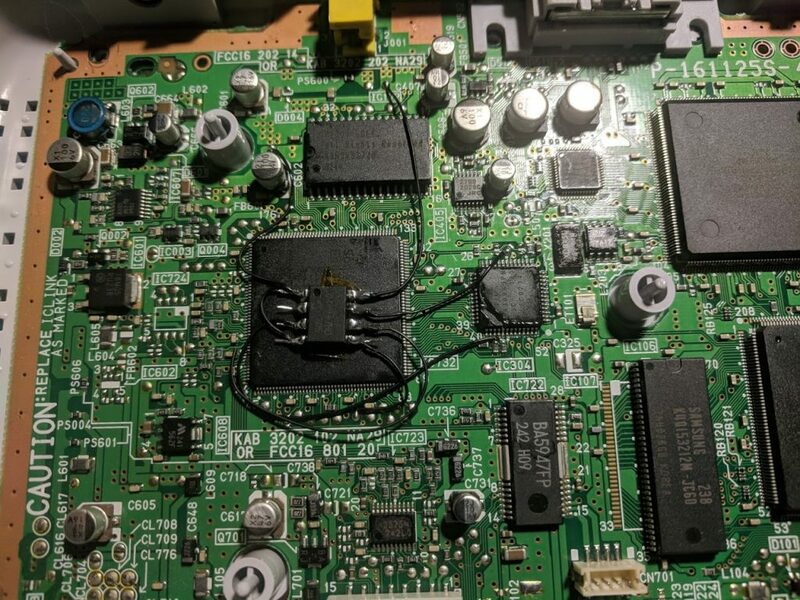 The place you soldered pin 2 to and the positioning of the modchip likely wouldn’t work even if it were the correct point. It’s a clock line and with that length of wire you’d run into issues. Try completely removing the chip and seeing if that allows the system to boot. There could also be a blown fuse somewhere. You can test the fuse components labeled PS# on the board with a multimeter.